The entire point of a corporation is concentrating capital, in order to gain the benefits that increased capital give a business. Well, that, and allowing the owners of the company to not be responsible for their own actions ("limited liability"), which has its own set of ethical concerns, but this whole essay series will be long enough without getting too much into that. It goes back to my first analogy - amid a free market place of individual buyers and sellers, WalMart comes in and buys the entire lot that the market is on, and now consumers no longer have any choice if they don't want to (or can't) travel to the next town over. In general the ability to quickly, easily, and cheaply raise large amounts of capital is very good for economic growth. The small individual entrepreneur would have to work a long time with a small positive net income in order to afford the large factor space, or machinery, or large workforce they may need to expand operations - and ultimately, increase efficiency via economies of scale. This makes a lot of sense to encourage if you happen to be the government of a developing economy. We - the United States - doesn't happen to fall into that category. Economists and politicians almost universally point to continued growth as the solution to all economic problems, but the reality is, we are already grown up. We don't need to grow anymore. There is (literally) more than enough to go around. Regardless of what new technology brings us in terms of cheap energy and environmental impact mitigation, we live on a finite planet, reaching other planetary systems in a human lifespan would violate the most fundamental aspects of physics, and so infinite growth is simply not an option. We are at (no - long past) the point where focus needs to shift away from growth and onto sustainability of production and distribution of existing wealth. As such, the corporation has outlived its usefulness. It is still doing what it's good at - allowing companies to grow increasingly huge, but there is no longer any particular benefit to society as a whole. The extent to which economies of scale push down production costs is offset by the forms that typical takes: capital allows corporations to invest in overseas factories and domestic robots, cutting costs by reducing the workforce. Since labor works in the same supply and demand style as products, any job lost to automation or outsourcing ultimately lowers wages across all jobs. In addition, corporate consolidation, as it eliminates competition by absorption, creates redundant job positions. This increases system wide efficiency, but at the cost of labor wages, as well as at the cost of competition, which is to the advantage of the consumer. 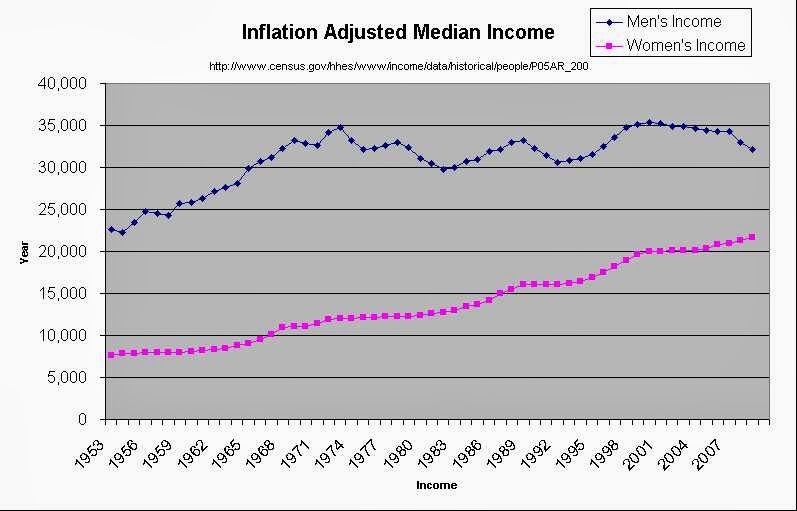 Note that most of the increase in household income comes not from real increases in average worker wages, but from women entering the workforce, creating 2 earner households, plus an increase in total working hours among all household workers. As there is less and less competition, there is little motivation for companies to pass along gains in efficiency to the consumer in the form of lower prices. Instead that profit all goes to the executives and shareholders. Much of the middle class think this is good for them, because they have investments in the market - a 401K or IRA if nothing else. 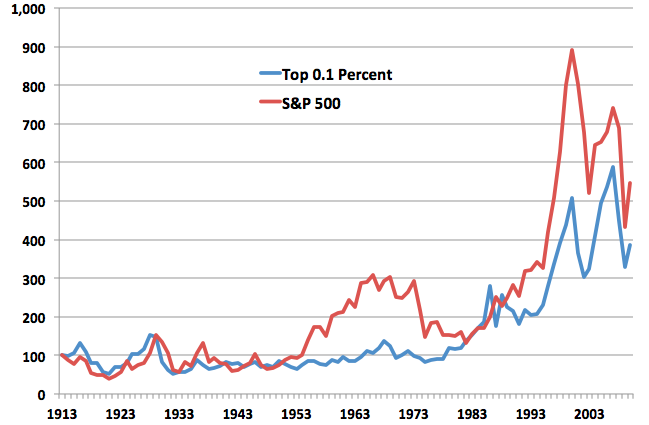 However, as concentrated as total wealth is, stock wealth is even more concentrated among the top 0.1% than total wealth. Almost the entirety of the benefit of the stock market goes to a small handful of extremely wealthy individuals. Their snowballs are already so large, and moving so fast, that they don't have to do any form of productive work to continue getting richer, no matter how fast they spend. The middle class gets just enough share of the benefits to pacify them, but it makes no sense to be happy with getting a few cents more in dividends every month when the cost is several fewer dollars per hour in wages. At the same time, many credit whatever companies happen to exist with "creating" jobs.